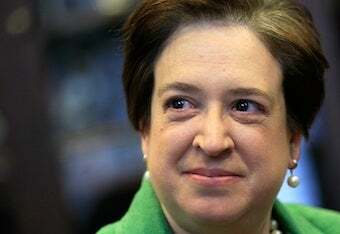 46,000 pages of documents have just been released from Supreme Court nominee Elena Kagan's work in the Clinton Administration. (Friday! Convenient!) They're still being sifted through, but so far there's not much to allay pro-choice fears. In a February 27, 1997 memo to top White House staff, Kagan notes a leading abortion rights supporter had just admitted late-term abortions were being "performed more frequently than pro-choice groups have acknowledged, and often perfonned [sic - performed] on healthy women with healthy fetuses," repeating a claim conservatives at the time had long made. "The president's position today remains what it has always been," wrote Kagan, "that he will sign a bill banning partial-birth abortions, but only if it has an exception that will protect those women — even if few in number — who need this procedure to save their lives or prevent serious harm to their health." Once again, Kagan was advising the executive branch to take a strategic position consistent with its stated goals, not necessarily pushing her own judicial philosophy. Still, even CNN notes that she uses the highly contested phrase "partial-birth abortion" uncritically. Maybe it was just a matter of shorthand. In any case, we don't seem to have progressed any further from the muddy, institutional-voice-oriented take on Kagan's ideology. Which seems to be exactly the point.